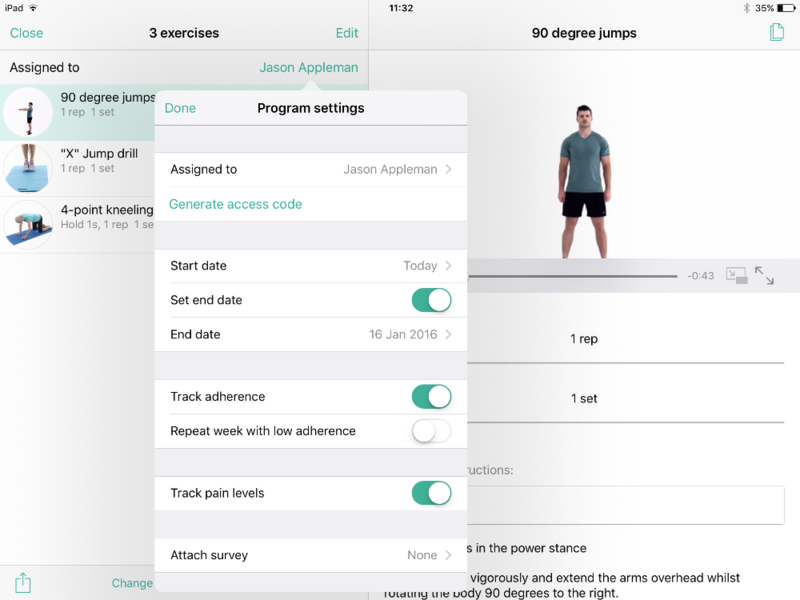 To start, download the latest version of Physitrack for iOS from the App Store. Open the app, and click on "Login" to login to your account. Login to your account. Use the same email and password that you also use on the web version. If you don't have an account, click "Create account" to create a new account. Tap on "Exercises" and choose either "Exercises" or "Exercise programs". To filter exercises or exercise programs, tap on the search icon in the top left of the screen. Double-tap (or long-press) on an exercise program to edit an exercise program, and see which exercises a program contains. 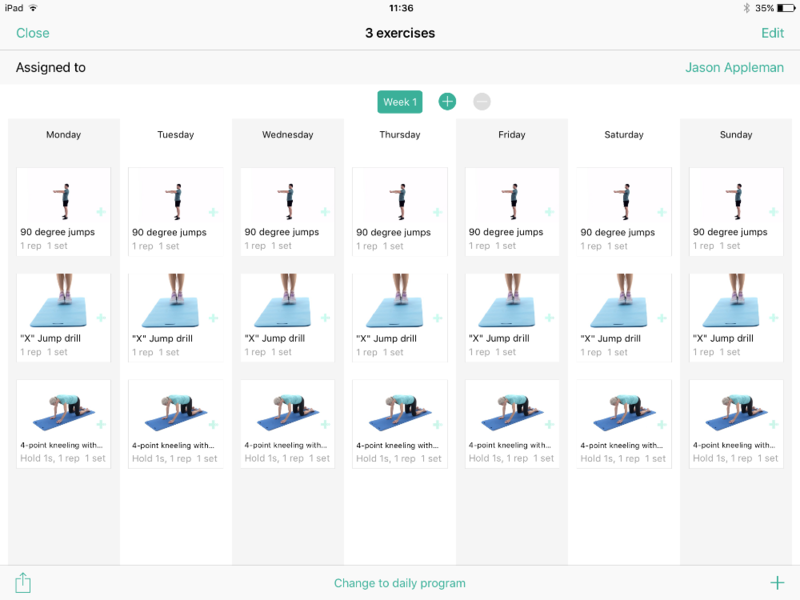 When you are done adding exercises or exercise programs to your exercise basket, click on the exercise basket icon (the counter in the top right of the screen). Daily program (default): a set of exercises that gets repeated every day. Weekly program: different exercises for different days, and even on different weeks. To assign the program to your client, tap on "Choose client". This will open up a window where you can choose from an existing client, or add a new client. Note that you can only assign a program to a client who currently doesn't have an exercise program assigned to him/her. 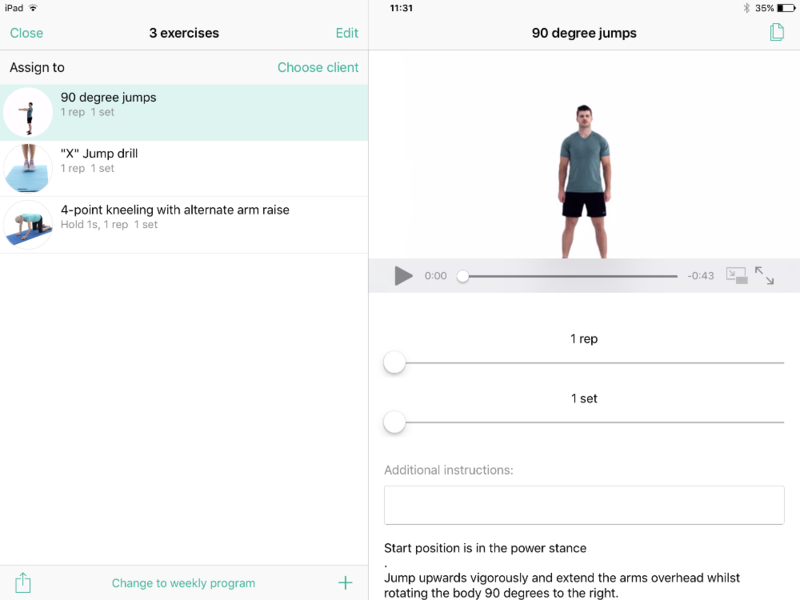 After you've chosen your client, you can set the settings for this exercise program, such as whether you want to track adherence, track pain levels and attach a survey to the program. When you are done, tap " Generate access code" to generate an access code for your client. Lastly, tap "Send access code" to email the access code to your client. Your client will then receive a message with his/her access code to access his/her exercise program on PhysiApp, our free app for your clients. 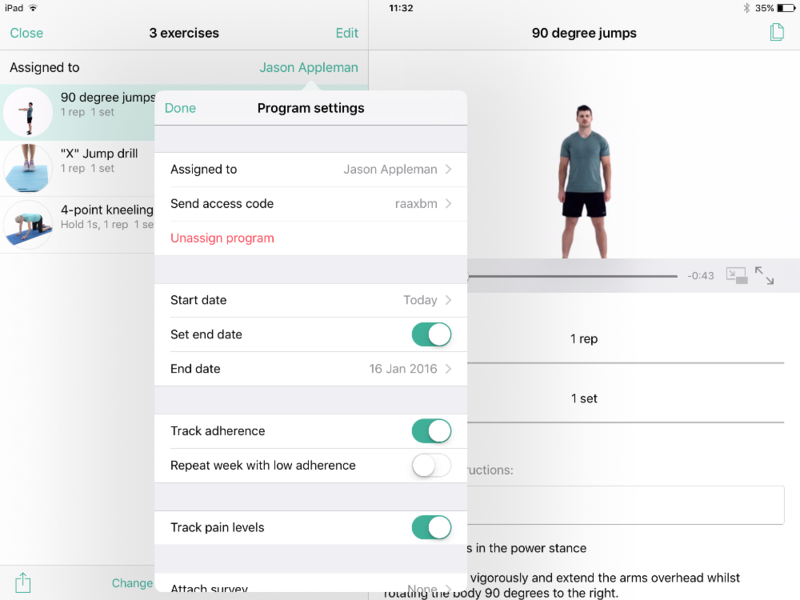 Tap on Assign program to assign a new exercise program to this client. Add exercises, set program parameters and generate the access code as outlined above. Note: You can access the Physitrack web version via your tablet or smart phone. Simply go to the web browser on your device (eg. Safari, Google Chrome, etc.) and go to www.physitrack.com to log in.